A series of lectures are held from from September to May. Details of upcoming lectures can be found in our news section. During the Summer months we organise visits to places of historical and archaeological association. 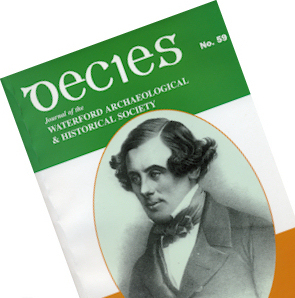 The Journal of the Waterford Archaeological and Historical Society is published in November each year. The society was founded in the mid 1950s as the Old Waterford Society. Winter lectures and summer outings were organised and an annual journal The Old Waterford Record published. Decies, the journal of the society was first published in 1976. In recent times the production of Decies has been assisted by a generous subvention from Waterford City Council and more recently also from Waterford County Council. The Waterford Archaeological and Historical Society organises a series of lectures from September to May and a series of outings to places of historical interest during the summer months. The Annual Subscription is €25. This fee entitles the member to admission to the lectures and outings as a copy of the annual journal.